How to Sharpen a Kitchen Knife with a step by step guide. One thing every kitchen needs is a set of good, sharp knives. They don’t have to be expensive, and they don’t have to be new. I know lots of people who prefer older, hand-me-down knives to brand new ones. What they do have to be though, is sharp, so I give you How to Sharpen a Kitchen Knife! The more you use a knife, the duller it’s going to get. 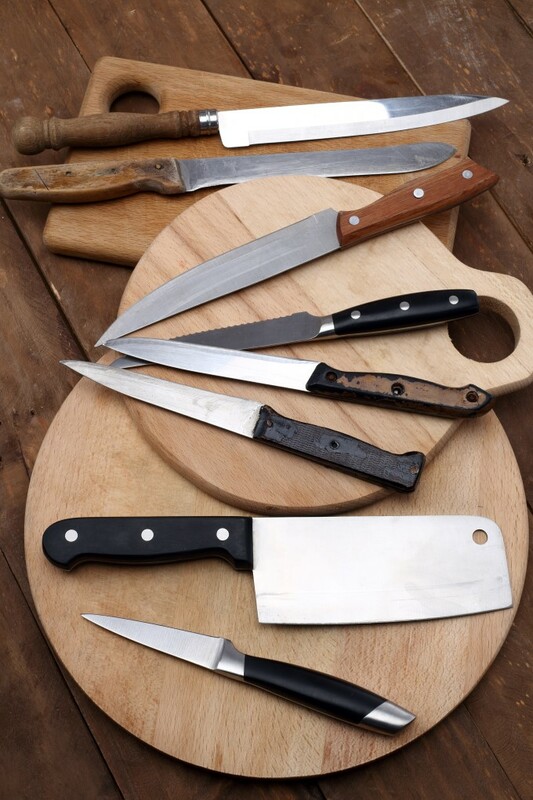 Storing your knives in a drawer where they can bump into other utensils, using them on stone counters or cutting boards, and leaving them to dry on the draining board can all make your knives dull and shorten their lifespans. Cutting with a dull knife is dangerous! You need to put more pressure on the blade and work harder to cut which raises the chances of getting cut. So at some point, you’re going to have to sharpen your kitchen knives. Which is one of those culinary tasks that sounds much harder than it is. 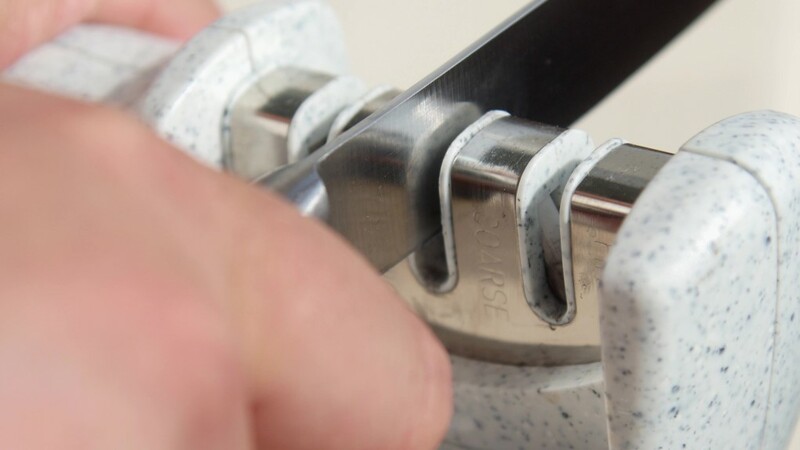 With the right tools, it’s not that difficult to sharpen your knives. There are a few different methods which I’ll describe briefly that you can use to sharpen knives. I will note that these are for steel knives only. While it is possible to sharpen ceramic knives, you will need a specific ceramic knife sharpener or you will ruin your knives. This holds true to serrated knives too as you need a sharpener made for them. If you can’t remember the last time you sharpened your knives, you’re probably going to want to use a knife sharpener. There are electric and manual versions, but they both function in a similar fashion. I’ll start with manual since the electric ones are expensive (and are only faster than manual sharpeners, they don’t necessarily work better). A manual knife sharpener has abrasive material either in a v-shaped chamber that you pull your knife through or on non-motorized wheels that turn as the knife goes through. You should always pull your knife towards you using even pressure when using a knife sharpener. Never push it as it could chip the blade. The abrasive material grinds the dull edge off of the knife leaving you with a sharp edge. You will need to run the knife through the knife sharpener multiple times to get the desired result. How many depends on the damage and dullness. Electric sharpeners function in much the same way except the wheels are motorized and spin against the blade. You need to use even less pressure with an electric sharpener compared to a manual one because the motor is doing most of the work. Some electric sharpeners have multiple slots with differing amounts of abrasive material so they can sharpen even heavily damaged knives. Whetstones are great tools for sharpening but take some practice to get a good edge with. The best thing about whetstones is that you can sharpen knives with different blade angles on them. You need to soak them in water for about 10 minutes before using them so it’s not an instant use tool. Though you can buy diamond stones that don’t require water to work. Your stone should have a rough side and a smooth side. Use the rough side first and finish with the smooth side. 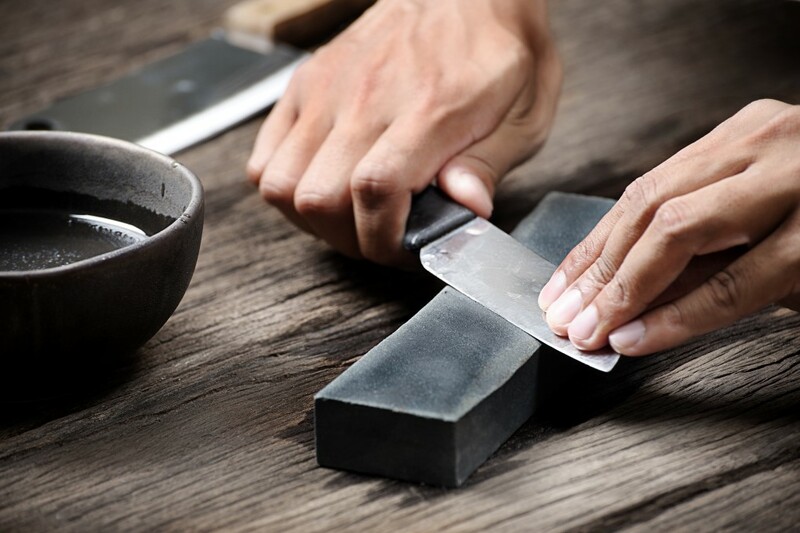 To use a whetstone, face the knife away from you and hold the blade at about a twenty degree angle against the stone. Sweep the knife (gently) across the stone – you’ll hear a rasping noise not unlike sandpaper – starting at the base of the knife and ending at the tip. Flip your knife over, and repeat the motion on the other side of the blade. You will need to repeat this process several times on each side of the knife before flipping the stone over to the fine side to finish using the same motion. Finally, if your knives are pretty sharp but need a little oomph, you can use a sharpening or honing steel, which are basically long metal rods with handles. You’ve likely seen them on TV – celebrity chefs like Gordon Ramsay like to hone their knives before each use. 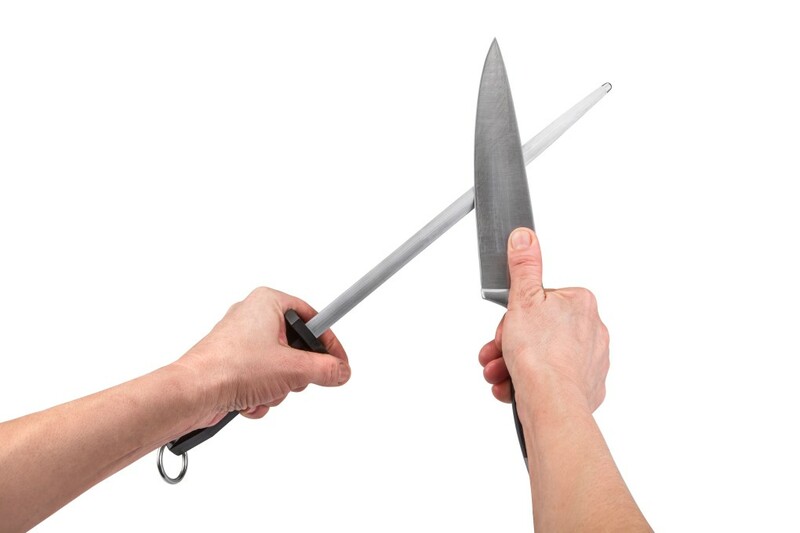 Sharpening steels aren’t much good for a really dull knife though – so use one of the other methods. To hone your blade, hold the sharpening steel in your non dominant hand and have your knife in the hand you use most often. So if you’re right handed, your knife should be in your right hand. Make a sweeping motion across the steel, while applying gentle, even pressure. Ensure you hone the entire blade from the base to the tip – this may take a few passes. Whether you use a knife sharpener, a whetstone, or a sharpening steel, there’s a definite learning curve. 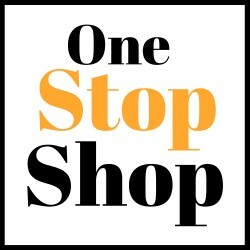 If you’re really apprehensive or have badly damaged knives, take them to a professional. Ask them to show you what you can do to maintain your blades at home. Once you see how much better your newly sharp knives cut, you’ll wonder why you waited so long. Thank you, I know how to use a steel but never knew how to use a whetstone, even though I watched my dad use it as a kid, I never learned. Great tips and photos. Something we should all know how to do. I know our knives could use a good sharpening. I have never sharpened a knife this way! We had this sharpener we bought at Bed, Bath and Beyond, and it was pretty good. Great tutorial! I have about 10 knives that need to be sharpened right now, how did you know? LOL Great tips! Sharpening with a stone has always intrigued me! I’ve seen people do it, but never have tried. I think it’s time to learn! This is really invaluable information, even for the most experience chef. Accidents usually happen because of dull knives! We so need to get our Cutco knives sharpened. I never realized how easy it is to sharpen them. Typically if you send them in and they sharpen them for you but that is a hassle. We have 4 knife sharpeners and I hate using any of them! I get so freaked out running a knife across the gritty surface! I have a sharpening stone and I can use it very well. I guess I can thank my grandfather for teaching me the skill. I hate having dull knives. It just makes me take a longer time to chop things up. wow! This is a very helpful post. Thanks for these great tips! I need new knives, mine are the worst even after sharpening. I will look into your recommendation at the top! Thank you for these tips! So detailed and I understood really well. I really need to try these, our knives are so poor.